Sunny & the Sunglows (later known as Sunny & the Sunliners) were an American musical group formed in 1959 in San Antonio, Texas. 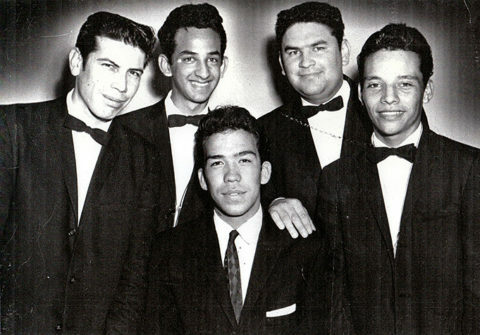 The group’s members were all chicanos with the exception of Amos Johnson Jr., and their style was a blend of rhythm and blues, tejano, blues, and mariachi. They first recorded in 1962 for their own label, Sunglow. Okeh Records picked up their single “Golly Gee” for national distribution that year, and in 1963, Huey P Meaux, a producer from Louisiana and owner of Tear Drop Records, had them record a cover version of Little Willie John’s 1958 hit, “Talk to Me, Talk to Me”. The single “Talk to Me” (b/w “Every Week, Every Month, Every Year”), released on Tear Drop Records (#3014), went to #4 on the Adult Contemporary chart, #12 on the US Black Singles chart, and #11 on the Billboard Hot 100 in October 1963. The group followed this release with several further covers – “Rags to Riches” (Tony Bennett) b/w “Not Even Judgment Day”, “Out of Sight-Out of Mind” (The Five Keys) b/w “No One Else Will Do”, and “La Cacahuata” (The Peanuts) b/w “Happy Hippo”.